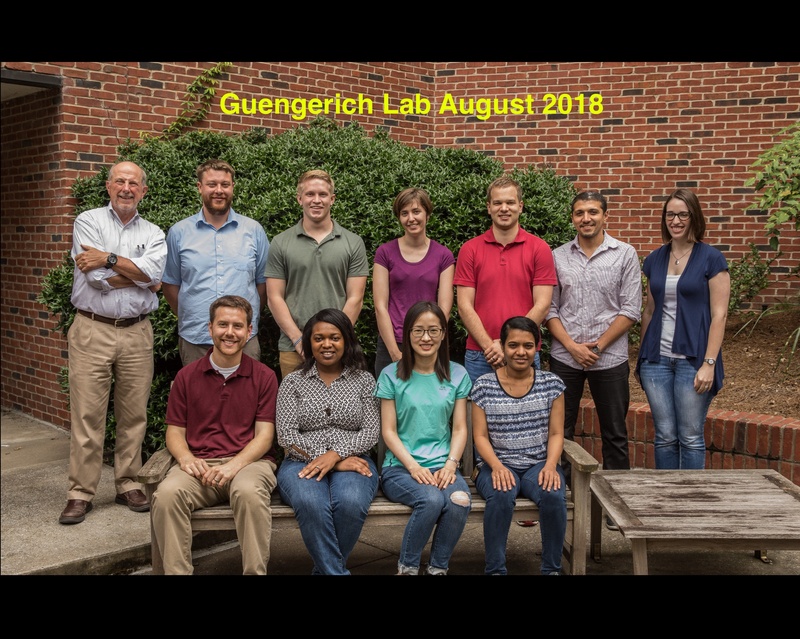 The Guengerich laboratory is interested in the enzymes involved in the activation and processing of xenobiotic chemicals (i.e., those not normally found in the body, such as drugs and carcinogens), as well as steroids and vitamins. (NIH R01 GM118122) involves the cytochrome P450 (P450) enzymes. Work involves the use of site-directed mutagenesis and the heterologous expression of human P450 enzymes in bacteria. The P450 enzymes are purified and used in experiments directed at understanding details of catalysis. The work involves chemical synthesis and analysis, spectroscopy, and kinetics. A focus is on understanding the function of the human “orphan” P450s. The catalytic mechanisms of several P450 steroid C-C cleavage and desaturation reactions are being investigated. Another focus is the role of oxidation of the cysteinyl heme ligand to a sulfenic acid and its relevance in biological function. (NIH R01 ES026955) This project involves how polymerases interact with carcinogen-modified DNA to produce base-pair and frameshift mutations. The work focuses on the use of site-specifically modified oligonucleotides (modified with carcinogens) and polymerase enzymology, focusing on mammalian translesion polymerases, and involves pre-steady-state and steady-state kinetic analysis of the polymerase reaction cycle, plus the use of X-ray crystallography in defining the relationships of structure and function, in collaboration with Prof. M. Egli, of this department. A new focus is the interaction of these DNA polymerases with RNA and ribonucleotides. (NIH R01 ES10546) involves how activated carcinogens react with proteins and DNA. The focus is on a series of halogenated hydrocarbons (ethylene dibromide) and other bifunctional electrophiles, e.g. butadiene diepoxide. Some of these chemicals are activated by conjugation with the tripeptide glutathione (GSH) by GSH transferases or a DNA repair protein (O6-alkylguanine DNA-alkyltransferase). Chemical and spectroscopic approaches are used, and a major goal is understanding how DNA-protein crosslinks cause base pair mutations. Another focus is biological roles of some unstable alkyl-purine DNA adducts. This is a collaboration with Prof. M. Egli dealing with two P450 enzymes involved in steroid biosynthesis, P450 17A1 and 21A2. P450 17A1 catalyzes the 17α-hydroxylation of progesterone and pregnenolone and then the subsequent “lyase” reaction to androstenedione or dehydroepiandrosterone. In fish, the P450 17A1 does both reactions but a second protein, P450 17A2, does only the former. We are analyzing the kinetics of the 2-step reaction and also have crystal structures of both zebrafish P450 17A1 and 17A2. One key question is why some human variants lose only the lyase activity. P450 21A2 catalyzes the 21-hydroxylation of progesterone and 17α-OH progesterone, and we have crystal structures of human P450 21A2 to use for the structural basis of the >100 clinically known defects in the enzyme.